The Hyde family has a unique friend: Narayan Shilpakar, an artisan living in Nepal, near Kathmandu. Shilpakar, his wife and adult son live in one room of an extended family house. Although Shilpakar is a talented carver, in his home country of Nepal—one stunted by poverty, illiteracy and political turmoil—his annual income was only $500. Then the Hyde family came along. At the beginning of this year, the Hydes of South Jordan embarked on a special endeavor. Following what he calls an “inspired thought,” Garrick Hyde began purchasing Nativity sets from third-world artisans like Shilpakar. “Our first order of Nativities to him tripled his annual income,” Garrick said. It also paid for gall bladder surgery Shilpakar had been putting off for years because he didn’t have enough money. ​Working through interpreters and fair trade organizations, the Hydes purchase intricate, hand-made Nativity scenes from artisans in Nepal, China and Mongolia. 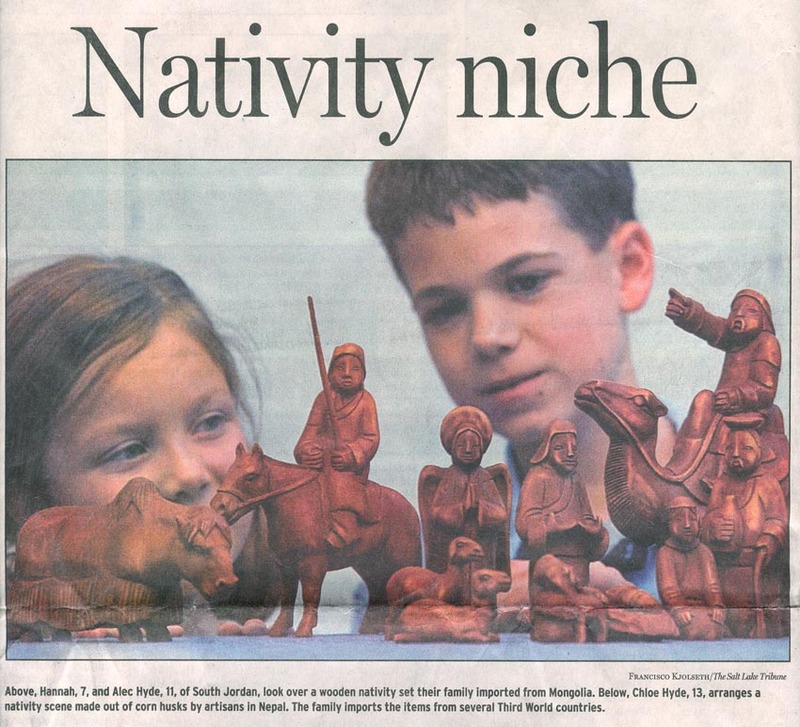 Then, using Internet auction site e-Bay and word of mouth, the Hydes sell the Nativity scenes at a small markup. The profit goes right back to the very countries the Nativities came from. So far this year, the Hyde family has donated more than $8,000 to Third World countries. Ginger Hyde had no second thoughts when her husband, Garrick, proposed the idea. That is not to say the project wasn’t without risks. The Hydes paid out of pocket for their first order of Nativities, which totaled $10,000. It wasn’t hard, however, to find a market for the unique items. “The collecting world out there, when they see them, they’ve never seen anything like it,” Garrick said. In addition to Shilpakar, the Hydes commission work from several other artisans. They work with a women’s cooperative in Nepal that makes Nativity scenes out of corn husks, a master artisan in China, Mr. Zhang, whose workshop creates wall hangings of the Holy Family using an ancient knot-tying technique, and a wood carver in Mongolia named Batmunkh. “As soon as we were willing to do this, all these projects just kind of fell in our laps,” Garrick said. The Hyde family has not traveled to any of the countries or met any of the artisans, but they feel a strong connection to the places and people. The family prays every night for Batmunkh, who seriously injured his hand this summer in a carving accident. Early in the project, Garrick learned the importance of helping people help themselves. The women working in the Nepali cooperative were offended when he offered to just write them a check instead of buying their products. “They said, ‘We want to help ourselves through trade, not aid,’’’ Garrick said. And the Hydes are helping more than just artisans by donating their profits. In addition to financing several micro-loan projects, the Hydes have donated money to several worldwide medical projects, and a program where engineers dig wells in remote villages. Choices about where the money goes are family decisions. Alec Hyde, 11, enjoys being part of the process. He and his older sister help inspect and package the Nativities. Seven-year-old Hannah draws a thank-you card to be sent out with each shipment. “I just like knowing that all the money we get, we give it to charity,” Alec said. His favorite charity is an orphanage in Nepal. He and his siblings even exchange letters and pictures with a young boy there. The Hydes agree the project has probably helped their family more than anyone else. Alec, a sixth-grader, hopes to visit the countries someday and meet the people he has learned so much about. Until then, the Hydes plan to keep giving.